Reading and share top 16 famous quotes and sayings about Purpose Of Government by famous authors and people. Browse top 16 famous quotes and sayings about Purpose Of Government by most favorite authors. 1. 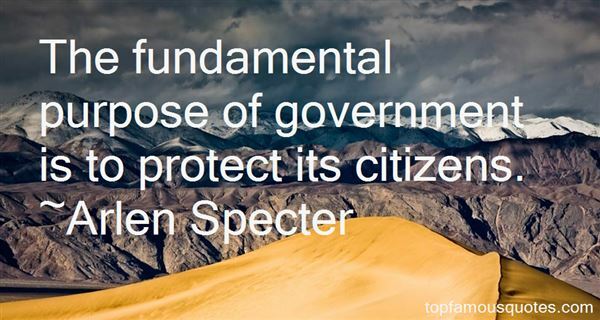 "The fundamental purpose of government is to protect its citizens." 2. "The only proper purpose of a government is to protect man's rights, which means: to protect him from physical violence. The only proper functions of a government are: the police, to protect you from criminals; the army, to protect you from foreign invaders; and the courts, to protect your property and contracts from breach or fraud by others, to settle disputes by rational rules, according to objective law. (John Galt)"
3. "Surely by now there can be few here who still believe the purpose of government is to protect us from the destructive activities of corporations. At last most of us must understand that the opposite is true: that the primary purpose of government is to protect those who run the economy from the outrage of injured citizens." 4. "If your basic premise about the fundamental purpose of our government is that it must provide for the common defense, then no other position is possible." 5. "Let us be clear at the outset that the liberty of individuals to carry on their business should not be abrogated unless the larger interests of the many are concerned. It is the purpose of government to see that not only the legitimate interests of the few are protected but that the welfare and rights of the many are conserved. These are the principals which must be remembered in any consideration of this question. This, I take it, is sound government-not politics." 6. ". . . in no instance has a system in regard to religion been ever established, but for the purpose, as well as with the effect of its being made an instrument of intimidation, corruption, and delusion, for the support of depredation and oppression in the hands of governments." 7. "The most fundamental purpose of government is defense, not empire." 8. 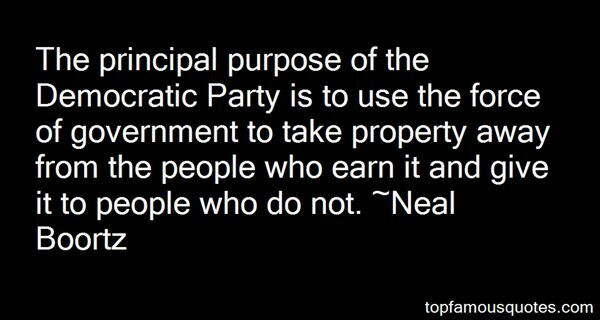 "The principal purpose of the Democratic Party is to use the force of government to take property away from the people who earn it and give it to people who do not." 9. "Looking at the purpose of our government toward the Indians, we find that after subjugating them it has been our policy to collect the different tribes on reservations and support them at the expense of our people." 10. "War is not violence and killing, pure and simple; war is controlled violence, for a purpose. The purpose of war is to support your government's decisions by force. The purpose is never to kill the enemy just to be killing him . . . but to make him do what you want him to do. Not killing . . . but controlled and purposeful violence.Robert A. Heinlein - Starship Troopers"
11. "If you like small government you need to work hard at having a strong national defense that is not so militant. Personal liberty is the purpose of government, to protect liberty - not to run your personal life, not to run the economy, and not to pretend that we can tell the world how they ought to live." 12. "It can have a secular purpose and have a relationship to God because God was presumed to be both over the state and the church, and separation of church and state was never meant to separate God from government." 13. "The purpose of government is to enable the people of a nation to live in safety and happiness. Government exists for the interests of the governed, not for the governors." 14. "If men will permit themselves to think, as rational beings ought to think, nothing can appear more ridiculous and absurd, exclusive of all moral reflections, than to be at the expence of building navies, filling them with men, and then hauling them into the ocean, to try which can sink each other fastester. Peace, which costs nothing, is attended with infintely more advantage than any victory with all its expence. But this, though it best answers the purpose of Nations, does not that of Court Governments, whose habited policy is pretence for taxation, places, and offices." 15. "Those men who laid the foundation of this American government andsigned the Declaration of Independence were the best spirits the God ofheaven could find on the face of the earth. They were choice spirits, notwicked men. General Washington and all the men who labored for the purposewere inspired of the Lord. "Topics: independence, government"
16. "The American citizen must be made aware that today a relatively small group of people is proclaiming its purposes to be the will of the People. That elitist approach to government must be repudiated." Voglio così tanto che non è quì e che non so dove cercarlo."